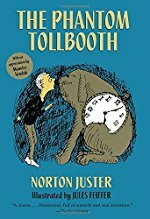 The Phantom Tollbooth is a children's fantasy adventure novel written by Norton Juster with illustrations by Jules Feiffer, published in 1961. The Valley of Sound chapter was in a textbook when I was in grade school and I found it fascinating. I didn't wind up reading the whole book until maybe high school but I loved it. I need to get a copy of it. My younger son and I are reading this right now! I think I was the only kid in my gifted elementary school class who didn't love this book, and I suspect I'm similarly alone among mefites. I couldn't relate to Milo, I didn't like the pictures, and the book felt preachy or moralistic or something to me when I tried to pick it up. My only really fond memory of it is that it taught me the word "doldrums." In reading some of these essays, I'm beginning to suspect that my seven-year-old reaction was in the vein of "why would I read this when I could be rereading the Alice books instead," and honestly, 32-year-old potrzebie feels about the same. It was very hard for me to get excited about a book with a male main character at that age, especially one that seemed to assume I had to be convinced to like school. I'll probably pick it up soon to see if my kids might like it, though. If you really love this book, how old were you when you read it? I think I was 10, give or take. I never particularly related to or cared about Milo, though. He was just the price I paid to read about all the other characters I loved. Milo is just the straight man for wacky things to happen to. Which is pretty much the same role that Alice plays. I never really thought of it as a character book at all -- I was there for the puns and the sideways skew-world, and the preachy bits slid off me like water from the duck's proverbial back. I remember being particularly fascinated by the idea of division dumplings and subtraction stew. I wish Feiffer's drawings had been used the way they were for Munro. The Annotated Phantom Tollbooth includes a note about Thomas Wilfred's Clavilux and Lumia (my uncle and brother collect and restore them) in the A Colorful Symphony chapter. Feiffer modeled the conductor on Leopold Stokowski, who owned one (coincidence). "Why, did you know that if a beaver two feet long with a tail a foot and a half long can build a dam twelve feet high and six feet wide in two days, all you would need to build Boulder Dam is a beaver sixty-eight feet long with a fifty-one-foot tail?" "Where would you find a beaver that big?" grumbled the Humbug as his pencil point snapped. "I'm sure I don't know," he replied, "but if you did, you'd certainly know what to do with him." "That's absurd," objected Milo, whose head was spinning from all the numbers and questions. I read this book first when I was a kid. I think I was about 7 or 8. I particularly remembered the exchange about being lost (ie how can you NOT know where you are. That scene stayed with me for decades. I reread about a decade ago as an adult and was charmed by it. I bought a copy at the Strand for like 50 cents on a whim wanting to see if it held up. I carried it about with me as I read it. The really striking thing is how many people stopped and spoke to me about it. It was a book that really resonated with people and they were so excited to share that. Movie's not great. Treacly, with uninspired songs that make "Cheer Up, Charlie" sound like "Pure Imagination." The book definitely rewarded re-reads. I first encountered it when I was 9? 10? as an excerpt in Childcraft, a kid's encyclopedia supplement. I was getting to the point where the rules and logic behind algorithms and formulas and their real-world uses interested me greatly, so the Mathemagician and the Dodecahedron really intrigued me. I did not know about The Annotated Phantom Tollbooth and shall have to seek it out. Thanks, brujita! In the audio version the dodecahedron speaks with various accents: iirc Spanish, French, German and Russian. Don't say there's nothing to do in the doooooooldrums. My love for this book knows no bounds. I don't know how many various copies I own, or how many times I have read it, or how many times I have gifted it. *sigh* I am still in search of lands to visit and wonderful things to see. Thank you Norton and Jules for setting my imagination on fire! I wish I could give a copy of THE PHANTOM TOLLBOOTH to every 7-10 year old on the planet! Thank you roger ackroyd for this wonderful post. I very much love this book and had to hold myself back from reading it to my kids before they were old enough for it. But it's definitely a favourite. I should probably re-read it again now that my kids are on the verge of being completely gone from our house. I think the best line in the book is when Milo gets shushed getting into the car shortly after arriving. Because it goes without saying. I remember the movie! And I actually really liked it. In fact, I think I saw the movie first. I distinctly remember the dodecahedron. I had never heard of a shape with that many sides and as an 8 year old with a love of big words, I was completely mesmerized.